Will 2010 Mark the End of the Stylus? Since the days of gray scale LCD screens on PDAs, the stylus has been the invaluable tool which allowed you to precisely navigate the small screen. With killer applications like the venerable PhatWare Calligrapher, which converts hand writing to text, you can use the stylus to mimic the analog world of pen and paper. Along, with integration of cell phone technology, the hope of a converged hand held device for your mobile life was starting to become a reality. As cellular data and push email where implemented, the world was starting to be at one's stylus tip. Microsoft along with Palm were visionaries in understanding that the success of this new world was tied to the innovation of third party applications and there again the stylus played a key role in providing an easy way to access application functionality. Although, Research In Motion has proved, with its thumb keyboard, that not everyone was or is a stylus devotee. However without the stylus the BlackBerry never became an multi faceted application device. The Windows Mobile vendors adjusted quickly to that fact and offer the best of both worlds with physical keyboards and/or styli support. Four years ago, Apple through a monkey wrench into the device design paradigm by introducing the iPhone, a device with no stylus or physical keyboard. Google Android has followed suit by providing a finger friendly OS which does not require a stylus but does allow for form factors with physical keyboards like the Motorola Droid. On the Windows Mobile front the HTC HD2 is the first device that I know of, that does not ship with a stylus. As we slowly move towards Windows Mobile 7, will the stylus become extinct? With the talk of capacitive styli (HTC HD2 stylus) for the new breed of touch sensitive screens, designers seem to be on the fence and if a majority of users are not clamoring for a stylus, over the next couple of years the stylus could become instinct. What are your thoughts, do you use a stylus or do you prefer your finger? Blogging from the iPhone listening to my music library using Bluetooth A2DP stereo streaming to my old Motorola DC800 home stereo adapter I reviewed back in 2006 on pocketnow.com. After re reading the review the problem with pairing the iPod (with BT adapter) was problematic at the time because you could not enter the required 0000 pairing code. 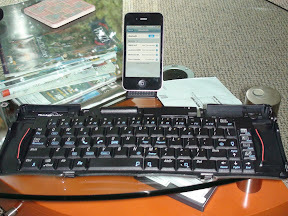 That is not a problem with the iPhone and it works very well with the iPhone OS 3.0. Although AVCRP remote control does not impact this configuration, I would love to understand why Apple left out the functionality. Another point: I was able to write a blog post and stream using Bluetooth back in 2006 on Windows Mobile. Sometimes it seems we have to take one step back to take two steps forward..
Apple sold 3.8 million iPhones last quarter in 81 countries; 1.6 million of those were activated on the AT&T wireless network. Approximately 640,000 of those were new AT&T customers. Those are great numbers but not as impressive as the total combined iPhone/Touch count of 37 millions. In March Apple announced that they had reached the 30 million mark at the end of December 2008, which means they sold 3.2 million Touch in the first quarter and through March 30, 2009 have sold 20.8 million iPhones and 16.2 million Touch. Even though the Touch is not a phone, it is a email/internet capable mobile computing device. If you include the Touch in a Windows Mobile/Blackberry comparison, the iPhone OS platform leaves Windows Mobile in the dust and it is fast on the heels of the Blackberry. As Apple has dominated the mobile Music Player world, it looks like they are on track to dominate the mobile email/internet mobile computing device marketplace. With comments from Verizon and AT&T lately, it is also clear that sooner or later a bidding war may erupt for exclusivity once the current contract with AT&T is up, Verizon has their 4th generation LTE network is running, and Apple delivers an LTE capable device. I would love to see an iPhone LTE device available on both networks. This would let AT&T go head to head with Verizon on network coverage and performance, but I am afraid Apple won't be able to refuse the cash incentives. Gartner just released their 2008 Smartphone sales estimate this week. On a device manufacturer basis Apple came in 3rd place behind Nokia and Research In Motion (RIM). On an Operating System basis, Apple's OS X came in 4th behind Microsoft's Windows Mobile. Nokia's Symbian was 1st and RIM's Blackberry OS was 2nd. The Symbian 2007 market share was 63.5 %, and 2008 was 52.4%; a decrease of 11.1 points, a 17% loss. The Blackberry OS 2007 market share was 9.6% and 2008 was 16.6%; an increase of 7 points, a 73% increase. The Windows Mobile OS 2007 market share was 12% and 2008 was 11.8%; a decrease of .2 points, a 2% loss. The OS X 2007 market share was 2.7% and 2008 was 8.2%; an increase of 5.5 points, a 204% increase. My take on these numbers is that the real race is between the Blackberry OS and OS X, while Symbian and Windows Mobile have the most to lose. The questions for 2009 will be whether Apple can break the Blackberry corporate hold with their 3.0 release (March 17th SDK announcement), is Microsoft's slide real or just a blip, and will Palm make a miraculous comeback with the Pre. As with any statistics you can view the numbers in many different ways and come up with your own conclusions.